I baked up an adapted version of the Sesame Banana Mini-Muffins my parents ate while staying at Poetry Ridge Bed and Breakfast in Greenfield, MA. They came back from their stay with the recipe, written in pencil on an index card. The muffins had apparently been made by the proprietors for another guest, who had multiple food allergies. They both raved about them, so I told them I'd give the recipe a shot despite my skepticism. The original recipe called for Splenda. Those of you who've been reading this blog for a while know that I don't usually go for artificial sweeteners. Don't kid yourself into thinking that Splenda is any more natural than any other artificial sweetener - It's not. But since I wanted to duplicate the recipe my parents had eaten as closely as possible, I decided to give Splenda a shot. The verdict? The muffins were good, and the loaf was even better, but I won't be baking with Splenda again. Unlike some people, I can detect quite an unpleasant aftertaste. I'll stick to agave nectar and its ilk - Natural sweeteners that are not sugar-free but are lower-glycemic than cane sugar and not over-processed. However, no one else who ate them complained about the Splenda taste so I think I must just have freakish taste buds. The sesame seeds in this recipe give a delightfully unusual texture to what would otherwise be banana bread (or banana muffins). I used untoasted sesame seeds - But I have called for toasted sesame seeds in the recipe since I believe that lightly toasted sesame seeds would improve the flavor and texture. 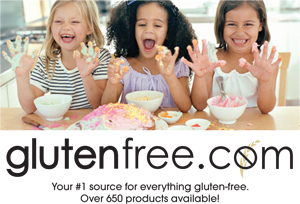 For the gluten-free flour the recipe calls for, any mix that contains xanthan or guar gum will work, such as Pamela's Ultimate Pancake & Baking Mix or Bob's Red Mill Wheat Free Biscuit & Baking Mix or my cake flour mix recipe. These muffins have a wonderfully moist texture - Yet they are also low-fat in addition to being sugar-free, which make them a good option for people who are on restricted diets. The quinoa flakes also increase the protein content quite a bit. You can easily replace the sour cream with Tofutti soy sour cream and the milk with soy or rice milk if you'd like to make these muffins dairy-free / pareve. They taste great at room temperature for several days, too. I poured the batter in both a silicone mini-muffin pan and a standard-sized tin bread pan. I enjoyed the cuteness and convenience factor of the mini-muffins, but the loaf took a slight lead when it came to taste and texture. This recipe makes enough batter to fill one mini-muffin pan and one bread pan, so you don't have to choose between the two! Cream Splenda and sour cream with electric hand-mixer. Mix in egg whites, bananas, vanilla. 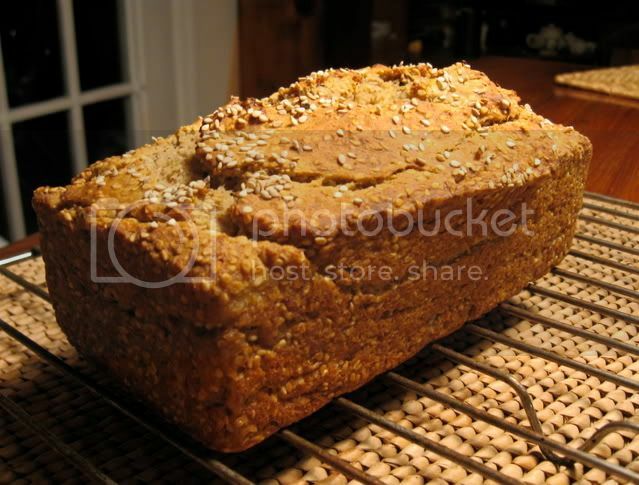 In a separate bowl mix together flour, quinoa flakes, sesame seeds, baking soda and salt. Add to batter and mix well. Pour into greased mini-muffin tins, filling each cup to the top, and/or pour into well-greased bread pan, filling to 1 inch below top. 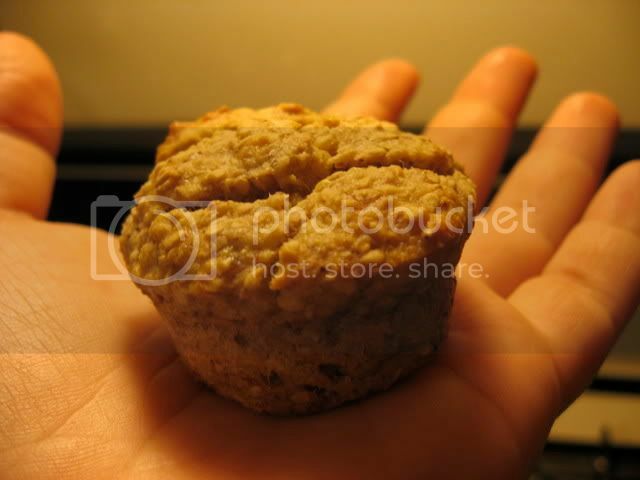 Bake muffins for 15-20 minutes and bake loaf for 35-45 minutes, or until toothpick comes out clean. When fellow food-blogger Karina of Gluten-Free Goddess was diagnosed with a litany of food allergies in addition to celiac disease, she felt overwhelmed. 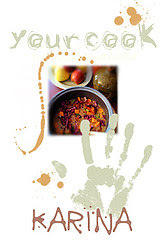 To give Karina a hand in figuring out what she can eat now that she has all these food limitations, I sent a call out for participants in a Cooking for Karina food blogging event. The goal of this event was to create recipes that Karina can eat. This meant avoiding the following ingredients: Cow's milk, cheese, whey, casein, goat's milk, eggs, chicken, turkey, gluten (that includes wheat, barley, rye, spelt, kamut - and oats, to play on the safe side), peanuts, almonds, walnuts, sunflower seeds, soybeans, lemon, avocado, pineapple, papaya, green beans and kidney beans. A great variety of mouth-watering submissions poured in from all over the blogosphere (and all over the globe). I hope this is helpful for those of you who are struggling with multiple food sensitivities and allergies, and maybe even those of you who aren't. Dig in! Meatballs a la Husband is a meaty contribution from Gluten Freedom. Gluten-a-Go-Go isn't afraid to turn on the oven in the middle of summer, and baked up a wonderful gluten-free, dairy-free and egg-free Olive Bread. Lucy at the United Kingdom's Free From Blog cooked Karina some BlackEyed Bean Cakes with Ginger Onion Marmalade. My own hot-weather contribution is Arugula Salad with Toasted Pumpkin Seeds & Grapefruit-Miso Dressing, made with fresh arugula picked from my garden. Use soy-free chickpea miso if you are allergic to soy. Peach Crisp for Karina is Sure Foods Living's offering to the Gluten-Free Goddess. We'd go back to school in a minute for Gluten-Free Cooking School's easy vegetarian Vegetable Gumbo. Wheat-Free, Meat-Free created a beautiful and vibrant Green Goddess Saute. 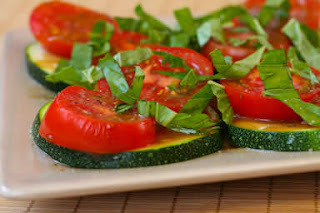 Sugar Delirium sent in a recipe for a fresh and colorful Quinoa with Tomatoes and Zucchini. Coconut Rice with Mango would make a great breakfast in addition to being a delicious dessert. Thanks Mrs. GF! TriniGourmet's inspired creation is a Carrot, Ginger and Cumin Salad. The Chocolate Lady of In Mol Araan created a truly delicious looking non-traditional twist on a Jewish classic: Zucchini Hemp Seed Latkes. If anyone knows about living with food allergies, it's AllergicGirl, who whipped up an Allergic Girl Variation on Burger Salad. Italy's Lucullian Delights wins the prize for innovation in food presentation for her Zucchini Embraced Eggplant, Zucchini and Grilled Pepper Dice with Capers. Smart & Tasty Kefir Power Smoothie is made with dairy-free coconut kefir to give you a shot of those much-needed probiotics. Thanks to CeliacChicks for this beverage creation. Instead of creating a new recipe, A Veggie Venture dug through their archives to find not one but dozens of Karina-friendly recipes! Karina, you are appreciated and supported by your food blogging community. I hope this roundup serves as a reference you can use when you get that "I can't eat anything!" feeling. This roundup has given its participants an opportunity to focus on the positive - Emphasizing what you/we can eat instead of what is off limits - which has been a useful experience for many of us. Thank you for all of the inspiration you continue to give your food-blogging compatriots and all of your readers! This week has been a whirlwind, so the roundup post for the Cooking for Karina event roundup post is a little delayed, though it's on its way. Thanks to all the wonderful people who participated! You all will be amazed at the variety of recipes people offered up. Of course, I had to make my own contribution. The past week and a half found upstate New York in a pretty intense heatwave, which was a good excuse to create a new installment of my Uncooking series of no-heat or low-heat summertime recipes, this one dedicated to Karina, the Gluten-Free Goddess. The arugula that inspired this recipe is from my garden. My principle for my vegetable and herb garden is that it should be built around things that are overly expensive to buy at the store. Thus my garden is full of fresh herbs that are hard to find at the market (or cost $2.99 for a little bunch that isn't particularly fresh), greens like arugula and gourmet mixed baby lettuce and rainbow chard, and leeks - lots of leeks. Arugula has such a delicious fresh and peppery bite. In the past I was intimidated by arugula's bitterness, so I always sauteed it lightly, but this week it was high time to learn to love the zippy-ness. After all, everything tastes good when you grow it yourself, right? 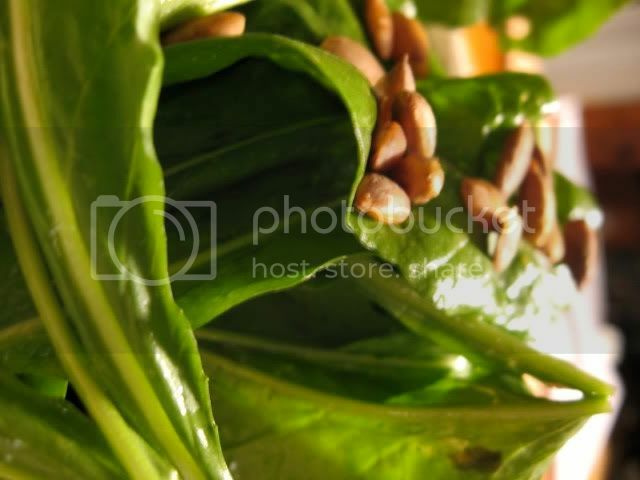 I wanted the unique taste of the arugula to feature prominently in this recipe, so unlike my usual tendency to add all manner of mix-ins to my salads, I added only freshly toasted, unsalted pepitas (pumpkin seeds). Citrus compliments arugula like nothing else, so I based my dressing on fresh squeezed grapefruit juice I extracted with a wooden reamer-- no need for a juicer if the grapefruit is ripe enough. The dressing add's just enough sweetness to the salad. To accommodate Karina's soy allergy, she could use a soy-free chickpea or azuki bean miso such as the ones made by South River Miso (which is made in small batches and is not shipped during the summer but is available the rest of the year through mail order) or Miso Master (widely available, hekshered kosher). Bon appetit, Karina! May these new limitations on your diet open up new doors to health and culinary creativity. Optional: Grapefruit segments, pith and membranes removed. Toast pumpkin seeds in toaster oven or on an ungreased skillet over low heat until they start to pop and become slightly browned. 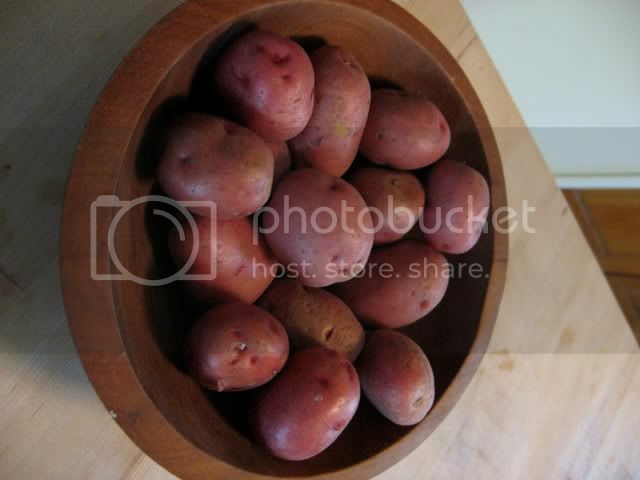 Remove from heat immediately and move to a small bowl. In another small bowl, whisk dressing ingredients with a fork until well combined. Place a small amount (approximately 1/4 cup) at the bottom of a salad bowl. Add greens, and use tongs to gently brush the greens through the dressing without crushing the leaves. Each leaf should be very lightly coated with dressing. 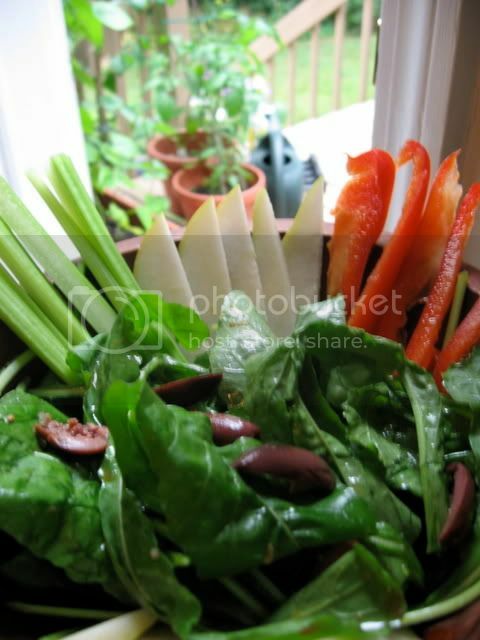 Place individual servings on plates or in bowls, and sprinkle with pepitas. Garnish with grapefruit sections if desired. Keep those submissions coming, folks! The food blog world is really showing Karina some love during this overwhelming time during which she's getting used to living with multiple food allergies. Bloggers from all over the world are creating recipes that avoid the allergens that make this fellow food blogger ill. There is still time to post a recipe (free of the foods Karina is allergic to) for inclusion in this blogging event! See my original post for the guidelines, including the list of foods to avoid. Please read them carefully. The deadline is Tuesday, July 10th. If you have your recipe posted and the link e-mailed to me by 11:59 PM EST, it will be included. Non-Bloggers: Unfortunately, if you don't have a blog, you cannot participate in this event per se. However, you can feel free to e-mail me favorite recipes that fit the bill and I will gladly compile and forward them to Karina. I've been amazed at all the non-bloggers who've been sending me recipes and tips for dealing with multiple food allergies! They won't be published in the roundup post, but they will hopefully still bring more smiles to Karina's face. Any questions? Ask 'em here! Thanks to everyone for their support and participation. Pass the word on to your fellow food-blogging friends. There are endless variations possible for breakfast pancakes. While I do make pancakes from scratch sometimes, I've found that I really prefer the pancakes I make with Pamela's Ultimate Baking and Pancake Mix*. For those who haven't already discovered this, Amazon has a great deal on a case of 6 bags... and hallelujah, Pamela's also now makes a a 4-pound bag , which is fabulous for those of us who use this as an all-purpose mix for most of our baking needs. Though I do make my own flour mixes, I love the convenience of Pamela's mix so I always keep a bag of it on hand. For pancakes, it can't be beat... Though you know I'll keep trying! I know a few of you are still waiting for my plantain pancake recipe. I haven't forgotten. When a cool morning and a well-ripened plantain coincide in my kitchen I will recreate that recipe to share with you all. But in the meantime, fix yourself a stack of gluten-free banana pancakes while singing this little ditty, share them with a loved one, and dig in. I enjoy these with tart blackberry jam spread on them and real maple syrup drizzled on top. Cut bananas in 1/4" rounds. Mix all ingredients except bananas together until smooth. No lumps should be visible. Heat a nonstick griddle over medium heat - If you use a griddle that isn't nonstick, grease lightly with additional vegetable oil or spray with cooking spray. When the griddle is hot, pour approximately 1/4 cup of batter onto it. 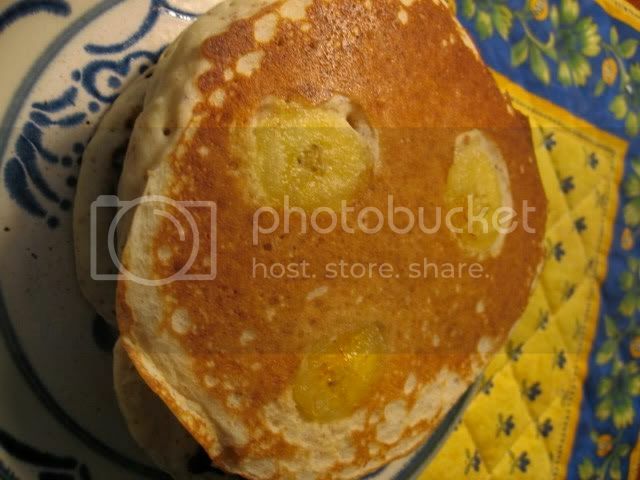 Immediately place 2-3 banana medallions on top of each pancake. 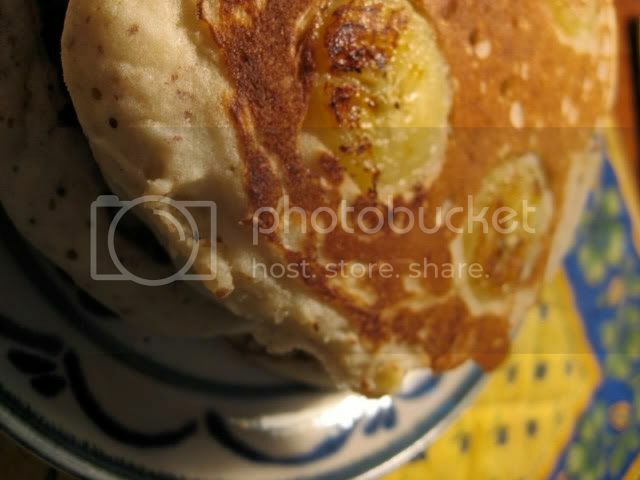 Allow to cook until the bottom of the pancake is golden brown and the edges begin to firm. Flip carefully and allow the second side to cook. Serve hot. Leftovers can be cooled and stored in ziploc bags, and reheated in microwave or toaster oven. 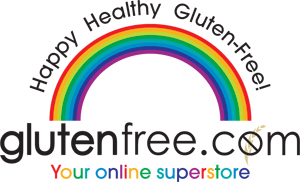 One of our own, the much adored Karina of Gluten-Free Goddess, just found out that she isn't just a gluten-free goddess, she is in fact a veritable Food Allergy Goddess. She recently discovered that she has a whole wagonload of other food allergies. Create and post an original recipe (or adaptation of someone else's recipe, with appropriate credit given) that is free of the following ingredients: Cow's milk, cheese, whey, casein, goat's milk, eggs (including whites and yolks), chicken, turkey, gluten (that includes wheat, barley, rye, spelt, kamut - and oats, to play on the safe side), peanuts, almonds, walnuts, sunflower seeds, soybeans, lemon, avocado, pineapple, papaya, green beans and kidney beans. Check your ingredients to make sure they don't contain derivatives of these ingredients- For example, almond oil or tofu. These aren't the only foods that people can be allergic to, but they are the foods Karina can no longer eat so by sticking to this list all our recipes will be ones she can use. E-mail me at glutenfreebay@ gmail.com (remove the space) with your name or online handle, the name and URL of your blog, and the URL of your post by Tuesday, July 10. Please write "Cooking for Karina" in the subject line. Photographs in posts are encouraged. All bloggers are welcome to participate, not just food bloggers! Food blogs that do not usually focus on food allergies are highly encouraged to join in and help us raise awareness of food allergies and intolerances. After receiving all of the entries, I will write them up into one grand summary with links to each of your individual recipe posts, and some photos, too. The idea behind this project is to focus on what someone with multiple allergies can eat. It is so easy for people to get overwhelmed when we find out something we eat is making us sick. We often start focusing on what we can't eat, rather than all the possibilities for what foods we can eat safely and deliciously. To make things harder, people in our lives who do not have multiple food allergies often see or hear a list of foods a friend or family member or stranger can't eat and think "Oh, there's no way I could cook for that person!" or "How deprived they must be!" So let's flip the script and focus on all the fabulous and delicious culinary options that exist. I hope this will be a nice way for participants to give themselves an enjoyable cooking challenge (limiting one's ingredient choices can inspire great discoveries in the kitchen) while doing something kind for Karina and other folks who have multiple food allergies.